It’s said that Sir Isaac Newton believed in a mysterious substance called ‘ether’ which surrounded everyone – a belief which helped him on the road to many discoveries. The thing is, though, it never actually existed. Isaac’s Eye, a new play making its Canadian debut at the Assembly Theatre, grants us discoveries about Newton himself by using the playwright’s very own ether – artistic license. Lucas Hnath’s play revolves around Newton’s infamous experiment when, as a young scientist, he stuck a needle in his eye to prove a point about light. An elaborate, but historically false, plot is concocted around the experiment, which illustrates Newton’s two great conflicts: his rivalry with Robert Hooke, and the struggle between his career and a family life. 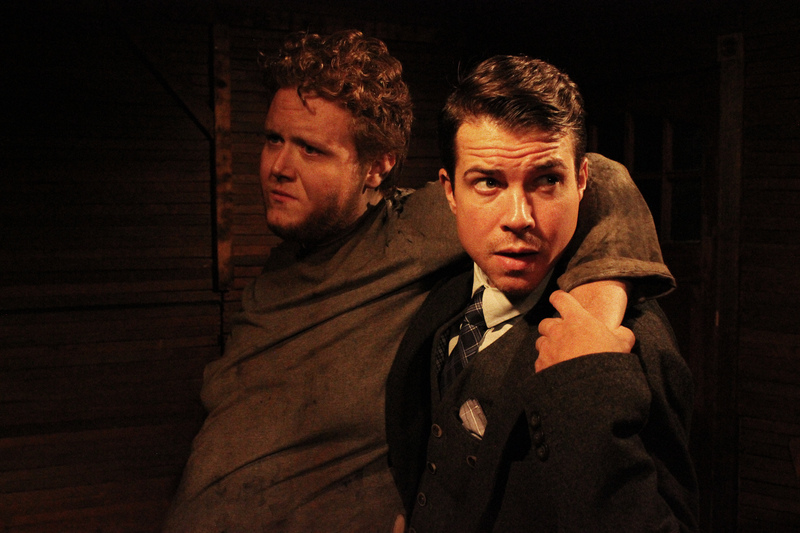 Unit 102 Actor’s Company’s production is at times utterly riveting, yet at others falls flat. It’s often clever and slick, yet sometimes confusing. As a result, a very promising set of ideas and moments don’t quite come together. But it’s entertaining nonetheless. We’re cleverly guided through the play by an actor, played by Francis Melling, who inserts himself into the plot as Sam, a sick man Hooke finds by the road. Melling’s interjections keep the pace going, and provide fascinating pieces of context about Newton’s life. Many of the play’s best points come in the intense conflict between Newton and Hooke. The young and enthusiastic Newton, played by Christo Graham, is trying to get into the Royal Society, but is thwarted by Brandon Thomas’ Hooke, who feels threatened by the bright young upstart. Their trading of intellectual blows is funny and energetic, their later attempts to blackmail each other are shocking, and the scenes with the needle are often hard to watch – in a good way. Thomas’ performance as Hooke is a particular highlight, with impeccable timing and delivery. He depicts a suave member of the establishment – dressed to a T by Jenni Lee Manis in a three-piece suit – drunk on reputation and willing to go to any length to stay at the top. The best aspect of the production, though, is the set – designed by first time director Adam Belanger, who has designed over a dozen for Unit 102. Wooden cladding covers the walls, giving the feel of 17th century Britain, with just a simple table and chairs in the room, and light passing through from a window with venetian blinds. Every part of the story which is historically accurate, not ether, is written down on chalk in the walls, and it adds a great deal to each scene. The play falters, however, with the occasional lack of focus and inconsistent writing. The character of Catherine Storer, played by Laura Vincent, comes across underwritten – the tension is lost in her scenes as she is left with making bland statements to drive the plot forward, allowing little room for intrigue. And in the second act, the production starts to drag with some repetitive, low-energy dialogue. The plot also sometimes gets lost along strange tangents, as it struggles to decide whether it’s a comedy, drama or black comedy. While it doesn’t necessarily need to be pigeon-holed, the comedic moments tend to work very well, but the play’s abrupt transitions to emotional moments tend to fall flat – especially when covering some dark material which hasn’t been dealt with sensitively. A mixture of British and Canadian accents also sometimes serves to destroy the illusion. There’s no doubt that audience members left the Assembly Theatre entertained. Given its fascinating subject matter, and brilliant set of ideas, though, the play could have been so much better. In: Assembly Theatre, Contemporary Theatre, Indie Theatre, Reviews, Theatre Reviews, Toronto, Unit 102 Actors Co.